These are the miracle-workers, right here. These little ceramic spoons full of this Asian stirfry-saucy cocktail have done wonders for me, and I had to share them with you. Take them whenever you've been exposed to illness (click here for the Immunity Series Part 2) or when you have fallen ill and need to recover quickly (Part 3 coming soon). The miracle lies in the garlicky smelling compounds. When garlic is crushed, the enzymes within convert one of its compounds into allicin, a potent antibacterial. But it's heat-sensitive, and thus, raw garlic is rich in allicin while your fettucine alfredo is not. Furthermore, besides the fragile but potent element allicin, there are 3 other compounds known as sulfides within garlic that are HIGHLY effective in killing microbes. Get this - they can actually penetrate and damage the cell membranes of nasty bacteria, helping to destroy infections in your body! Studies show that taking garlic not only helps keep you from getting sick, but it can help you recover up to 4x faster. Read this study and be amazed: Preventing the Common Cold with a Garlic Supplement. Paired with the immune-system revving, antibacterial apple cider vinegar, and antibacterial raw, unpasteurized honey, this really is the atomic bomb of cold and flu fighting natural remedies. Click through the gallery below to follow along visually. Remove the skin, slice vertically into long strips, then slice horizontally... and, voila! Minced garlic! Apple Cider Vinegar- (get the unfiltered, with the "mother", raw kind.) Put a teaspoon or two into the spoon. Top with the minced garlic. 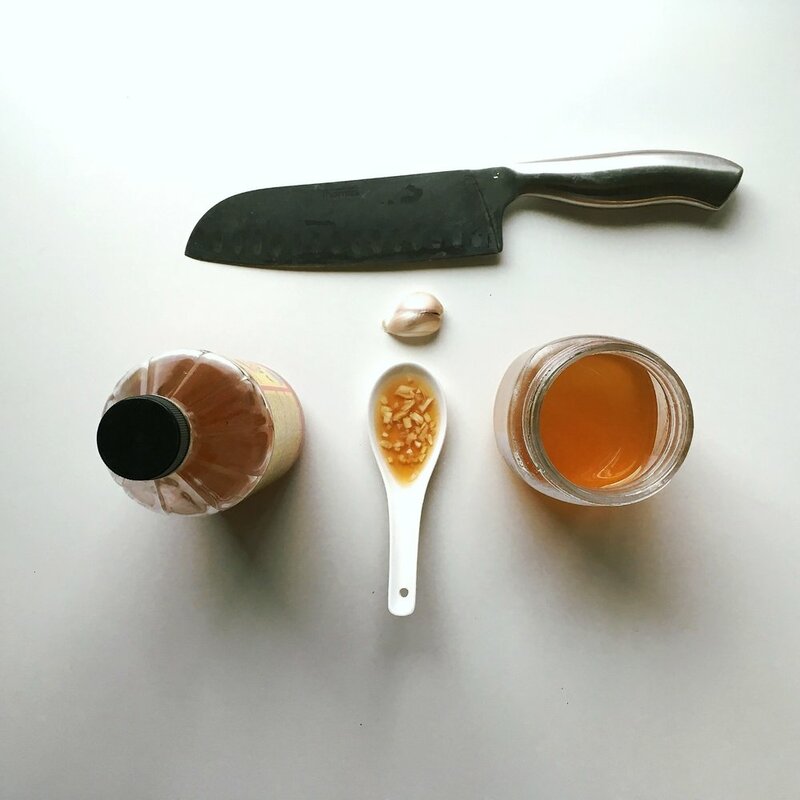 Raw Honey- drizzle over the top to both to cover the taste of the garlic/vinegar, and to rev your immune system! Drumroll... Take the shot! Do this once or twice a day when simply on the defense, or if fighting a full-blown illness take every 3 hours.